Governor Rick Perry has been talking National security of – and within – our borders since before September 11, 2001. The big difference between Rick Perry and some of the other Presidential candidates is that he sees the big picture – and has for years. By raising concerns about the safety of nuclear waste sites in August, 2001, Governor Perry acknowledged that National security isn’t only about control of the Nation’s entry points and protection against illegal entry. It also includes tracking those here on visas and securing vital services and infrastructure from sabotage and terrorism. The Border Patrol should be allowed to turn back those who enter illegally and Immigration and Customs Enforcement should be able and allowed to identify, locate and deport those who over-stay their visas,as well as the people who manage to evade the security at the border. But just as important to “Homeland Security,” the States and Federal government should cooperate and coordinate to make sure that our transportation, energy, water and public health are safe from those who would harm us. If the Nation’s entry point and Immigration procedures functioned as they should and our infrastructure were hardened to protect against terrorism, it’s unlikely that 9/11 would have happened at all. We also wouldn’t see the debate turned into accusations of “racism” by the Left and the attempt by so many to paint all of the GOP as xenophobes looking for scapegoats. The numbers of the actual illegal aliens and their costs, as well as the crimes from drug smuggling and criminal illegal aliens, would not be the expensive problem that it is. We certainly wouldn’t have the burden of “anchor babies” that is causing so much controversy this week. Instead of focusing on Nations of origin and other groups, true National security should be the focus of everyone who understands the Constitution and the role of the Federal Government. During the 60-minute session, officials revealed that Greyhound buses leaving downtown McAllen station have sold out daily, forcing immigrants trying to travel beyond the Valley to remain here overnight. Federal immigration officials drop off at the bus station children immigrants travelling with family members. Those family units are given a notice to appear later before an immigration court. “Greyhound is overwhelmed. They do not have a single empty seat,” said Kevin Pagan, McAllen emergency management coordinator and the city’s attorney. Pagan said there have been 3,000 immigrants helped by Catholic Charities’ makeshift respite shelter at Sacred Heart Church, and at least 500 of them have had to stay overnight in McAllen recently due to the lack of transportation out of the area. via Hidalgo County says immigrant influx not an emergency – Valley Morning Star : Local News. President Obama celebrated illegal immigrant children as “Champions of Change” at the White House the same day the Vice President traveled to Central America to convince – bribe? – governments and parents not to send their children here. And yet, children entering the US illegally today are being told – sometimes by US lawyers – that they can stay if they say they are victims of abuse or refugees from violence. US Border Patrol representatives tell us that very few are returned to their country of origin. In the meantime, they are sent to a growing number of shelters like the Fort Worth Catholic Charities, which is celebrating the one year anniversary of its government contract. We keep hearing from people like Rand Paul, Grover Norquist and Rupert Murdock that we must support “comprehensive immigration reform” that would allow people already here illegally to stay. Wouldn’t that just create a new incentive for more illegal immigrants? A January hearing featured the muffled coos of a toddler in the back row. A 2-year-old Honduran girl named Jennifer Tatiana came in the arms of her mother. The child was the respondent in the case, as those headed for a possible deportation are called. At the government’s request, a venue change was granted to Atlanta where the mother now lives. Jennifer Tatiana sucked her thumb through the proceedings. While President Obama celebrates the chaos that is the result of his Deferred Action for Childhood Arrival (DACA), I doubt that most of the people who sympathize with the plight of illegal aliens are aware of the harmful consequences of what seems to be compassion. Real people, many of them children, are in harm’s way because they have been misled into believing that they will receive “permisos” and be allowed to stay in the United States. 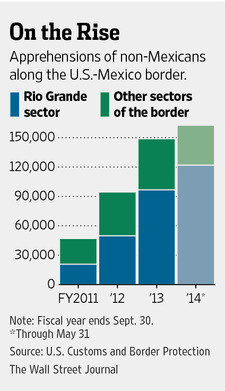 Southwest border apprehensions: (Oct. 1- May 31) 323,675, a 15 percent increase from fiscal year 2013. Rio Grande Valley (South Texas) border apprehensions: (Oct. 1-May 31) 163,542, a 74 percent increase from fiscal year 2013. Southwest border apprehensions of Other-than-Mexican citizens: (Oct. 1 – May 31) 162,757, 50 percent of the total Southwest border apprehensions. Rio Grande Valley (South Texas) border apprehensions of Other-than-Mexican citizens: (Oct. 1-May 31) 122,070, 75 percent of total Rio Grande Valley apprehensions. It even goes beyond the danger to us all from diseases entering the Country, like rabies that killed a man from Guatemala last year (after he had been in several holding facilities and two hospitals), drug-resistant tuberculosis found in a man from Asia last year and other illnesses that result from close quarters with poor hygiene. Mexico’s Human Rights Commission estimates that at least 20,000 migrants get kidnapped every year in Mexico, often with the assistance of local police or other officials. The gangs hold the migrants and demand hundreds or even thousands of dollars for their release. The abuse and danger are likely to follow them where ever they try to find work and a place to live. I was doctor to one family who was still trying to qualify for the 1986 Reagan amnesty through 1998, although everyone in their families knew the couple didn’t meet the criteria of that amnesty. They had children who were born in Texas, but a Houston lawyer convinced them that registering the births or applying for Medicaid would endanger their status. (Perhaps it was more the thousands of dollars they paid him each year?). They couldn’t afford a place to live and couldn’t get a good job because of their status. I doubt that the system is any better, even with Obama’s DACA and his Administration’s dismissal of thousands of immigration cases. Repeating the mistakes of the past, even out of compassion, only puts more of those we would help in danger. Is it true that a US citizen can’t enter because of high-handed bureaucrats? Olivas was returning to the United States from Mexico officials unlawfully refused to allow him to enter the United States, may have issued an order of removal against him, and referred him for a hearing at an unspecified date that occurred,” according to the complaint. Olivas says he has a U.S. birth certificate, but a State Department official coerced his mother into saying that the certificate was falsified. Olivas was issued a “delayed registration of birth” certificate in 1970, five months after he was born, because his mother – then a Mexican national – “was fearful of giving birth in a hospital and instead delivered Mr. Olivas in a private residence with the assistance of a midwife,” the complaint states. More on the lawsuit at Breitbart.com. New York: to Grant Undocumented Immigrants State Citizenship? This Bill hasn’t passed, and the article doesn’t indicate that it has much chance. However, isn’t this news just one more (giant) magnet for illegal aliens? While Congress drags its feet on immigration reform, New York State lawmakers are mulling an immigration bill of their own: It would grant state citizenship to some noncitizen immigrants, including undocumented residents, allowing them to vote and run for office. Under the New York Is Home Act, noncitizen residents who have proof of identity and have lived and paid taxes in the state for three years could apply for legal status that would let some qualify for Medicaid coverage, professional licensing, tuition assistance, and driver’s licenses, as well as state and local—but not federal—voting rights. The responsibilities of citizenship would also apply, including jury duty. via In New York, a Bill to Grant Undocumented Immigrants State Citizenship – Businessweek. What can we do to help moderate what appears to be the makings of an international crisis due to the numbers of families and vulnerable, unaccompanied children entering our country? Please see this post about the issue at WingRight.org, “A minor border crisis.” I am concerned that the unaccompanied minor children in these stories are being used in a political ploy designed to beat away at the resistance to “immigration reform.” Whether that is true or not, they are suffering physical and sexual abuse and abandoned due to the inadequate system in place at this time. As to the “practical action” that I mention in the blog post, perhaps we could utilize the systems for handling refugees that the State of Texas built after Katrina. Our goal should be to return these children and families with minor children to their homes in their own country immediately after they are caught and funding for the effort should come from the Federal government. Since I’m not sure we can count on this Administration to agree, Texas must take the lead. I’m offering to work as a volunteer anywhere I can be of assistance, whether as a doctor and/or doing the “scut work” in coordination of the effort.